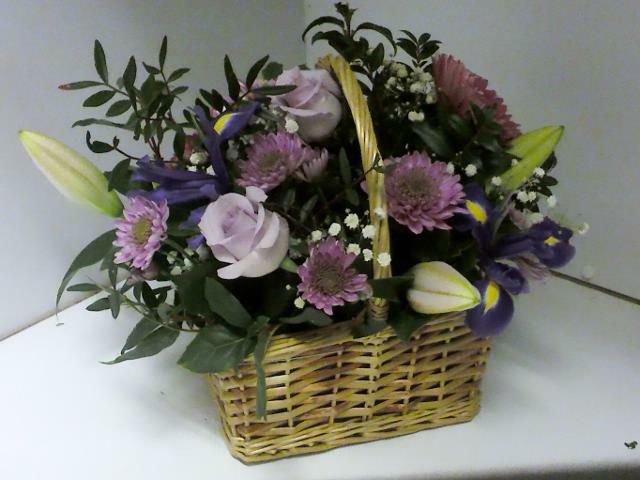 Wicker hooped basket with an arrangement of seasonal flowers including Lillies, Roses, Chrysants and foliage. All arranged in oasis by our skilled florists. Seasonal flower arrangement in a nice wicker basket. Made using seasonal flowers in a colour of your choice. Fresh flowers always make a lovely gift for anyone whether it be a birthday, anniversary, get well or just to say thank you. This can be ordered in different sizes and colours. This basket of flowers is lovely and will be well admired by anyone that receives them.